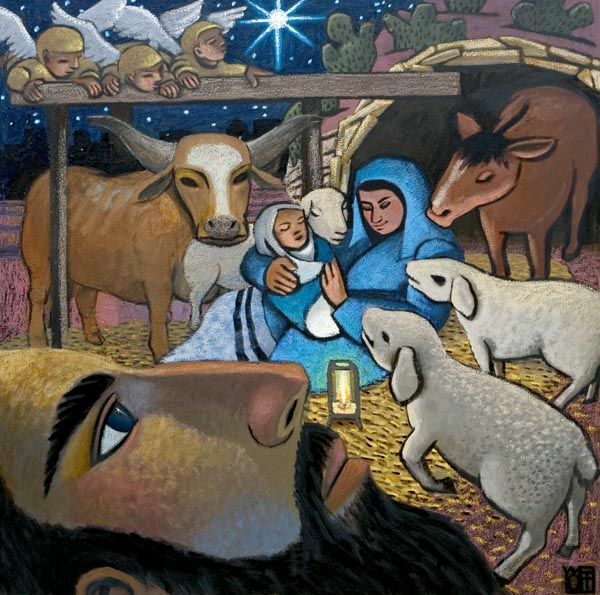 Christmas Day: A Child Is Born – For Us! (He is) A to Z, the First and the Final, Beginning and Conclusion. This Advent season, thank you for joining us for a 14-session blog series which combines the reading of the Christmas story, as found in God’s Word, with seeing, using fourteen pieces of beautiful artwork that can bring your imagination to life. We suggest that you bookmark our home page to review all fourteen entries. May you and yours have a blessed Christmas! Here’s how to best use Lectio Divina & Visio Divina during this Christmas season. 1) Prepare: Find a quiet place where you can be free of distractions. Close your eyes, breathe, clear your mind, asking God to enter into your time of prayer. Welcome Jesus into your midst, asking the Holy Spirit to speak to you through your reading of God’s Word and your meditation on the Christmas image in today’s blog. 2) Lectio (read): Open your eyes and slowly read today’s Christmas text. Notice what words are drawing your interest. Ponder slowly on those words. Ask the Holy Spirit to work with your imagination, drawing you deeper into these familiar words. Close and rest your eyes a minute. 3) Mediatio (meditate): Open your eyes and scan the entire image we’ve given you today. Let your eyes be led. Focus on the part of the image that catches your eye and name it. Sit with the picture for a moment. Close your eyes, once again, imagining that piece of the image in your mind. 4) Oratio (pray): Open your eyes and look again at the piece of the image that caught your attention. Pray, asking God to bring forth a word, a thought, an image, or an emotion that might be associated with what you are seeing. Close and rest your eyes. 5) Contemplatio (contemplation): Open your eyes and gaze, one final time, at the whole image. Slowly re-read the Christmas text for today as well. Pause. Breathe. Go slow. What is God speaking to you today through these words and this image? How will you respond to Him? Spend some time processing these things with Jesus. Pray a prayer of closure, asking the Holy Spirit to indwell and empower you as you go through your day. In closing, you might want to journal a few notes about your Lectio Divina & Visio Divina experience today. What is Jesus speaking to you today through these Christmas-time words and image?